Do you have problems with your teeth? Do you need an extraction, dentures, braces, dental implants, or jaw bone repairs? You are in luck, as our oral surgery Lauderdale by the Sea FL treatments are performed by experts in the field! If you still have some missing information about oral surgery and its relationship to other commonplace dental procedures, it’s time to have a chat with our team of experts! 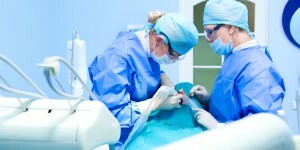 Who Can Perform Oral Surgery? Oral surgery is one of the nine specialty areas of dentistry. Oral surgeons, just like other surgeons, receive specific education and training and are required to follow continuous instruction and practice. While oral surgeons can cover a very wide variety of problems spreading to your face, teeth, mouth, and jaw, they also work hand in hand with other colleagues specialized in different dentistry areas so they can offer comprehensive treatments. Our oral surgery Lauderdale by the Sea FL colleagues have nearly 60 years of combined medical practice and they receive continuous education. Moreover, they work with the latest equipment and techniques to offer efficient, non-invasive, and highly successful interventions. What Dental Problems Require Oral Surgery? One might not know, but many commonplace dental procedures can be categorized as oral surgery. The most known dental problem requiring oral surgery is impacted wisdom tooth removal. Dental implants include oral surgery, together with crowded teeth extractions when it comes to fitting and fixing dentures or braces. Jaw bone grafting and TMJ are also issues that need an oral surgeon. Oral surgeons deal with more complex problems, of course, including facial injuries or infections, jaw bone repairs (sometimes working with plastic surgeons as well), severe teeth damages and trauma, sleep apnea, and so on. Our oral surgery Lauderdale by the Sea FL experts are trained to use the latest equipment, materials, techniques and procedures to tackle all such problems in our dental office. The fact that we offer integrated dental services under one roof makes our patient save a lot of time and money, not to mention they are cared for A to Z by practitioners who are familiar and invested with their cases. What Else Should You Know about our Oral Surgery Lauderdale by the Sea FL Interventions? Besides being experts in our field and a model of good practices in patient care, we also work creatively with all our patients to make all their oral surgery Lauderdale by the Sea FL treatments affordable and completely anxiety-free.